The 2015 Japan Society of Colour Material meeting for the presentation of research papers was held at Chiba Institute of Technology on October 20 and 21, 2015. 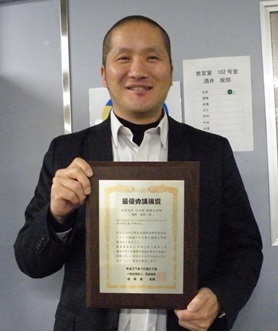 Associate professor Toshio Sakai from the Department of Chemistry and Material Engineering received the Best Lecture 2015 award. The award was for a presentation entitled “Palladium Nano-Coating on Polymer Particles Using Ultrasound”, a joint research project with Yuya Nakai. The presentation describes the palladium nano-coating on polymer particles by ultrasonication to an aqueous sodium tetrachloropalladate (II) solution containing polymer particles. This nano-coating technique was demonstrated in the most simplified experimental system consisting of a metallic salt, polymer particles and water.